Advances in color printing technologies combined with decreasing costs of publication led to a flowering of illustrated sheet music between 1890 and the 1920s. This small collection is comprised of illustrated sheet music dating primarily from the first quarter of the twentieth century. Representing a cross-section of popular music at the time from minstrel tunes to patriotic marches, most of the songs were selected either for their representation of African Americans (usually in stereotypical and racist caricature) or as examples of pro-war propaganda during the First World War. Song sheets and sheet music have been a focal point for publishers in Britain since at least the seventeenth century and the United States since the latter half of the eighteenth century. For popular music in particular, publishers recognized early on that a well-chosen illustration drove sales, and as changes in printing technologies lowered the costs of producing illustrations, the front wrappers of popular songs were increasingly given over to eye-catching graphics. Lithographed covers became common beginning in the 1820s, and by the 1840s, color was added to the mix. 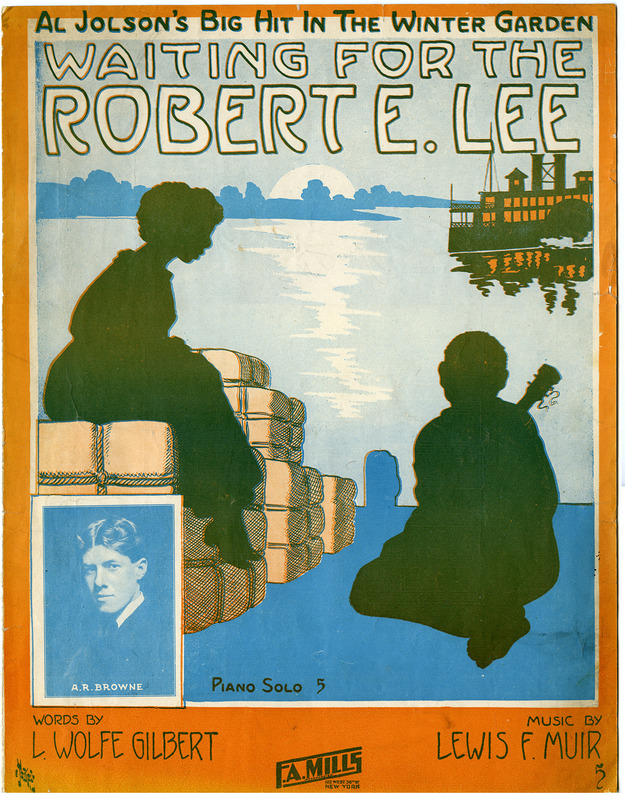 As half-tone illustration further drove down costs in the latter two decades of the century, illustrated sheet music reached a peak of popularity. Arlen, Harold (music) and Johnny Mercer (lyrics): Come rain or come shine (from St. Louis woman). New York : A-M Music Corp.
Arlen, Harold (music) and Johnny Mercer (lyrics): I had myself a true love (from St. Louis woman). New York : A-M Music Corp.
Arlen, Harold (music) and Johnny Mercer (lyrics): Legalize my name (from St. Louis woman). New York : A-M Music Corp.
Ash, Frances: I'm going to love that guy (like he's never been lover before). New York : Bourne Inc.
Atteridge (words) and Jean Schwartz and Al Jolson (music): Tell that to the Marines. New York : Waterson, Berlin and Snyder Co.
Berlin, Irving: Oh how I hate to get up in the morning. New York : Waterson, Berling, and Snyder Co.
Blawry, M. B.: The Nicodemus two step: the latest Ethiopian oddity. Boston : Vivian Music Publ. Co.
Bowles, Fred G. (words) and Wilfrid Sanderson (music): God be with our boys to-night. New York : Boosey and Co.
Brown, A. Seymour and Eddie Leonard (lyrics) and Nat O. Ayer (music): Eddie Leonard's O-O-Ohio Song. New York : Jerome H. Remick and Co.
Brown, Lew and Charles McCarron: What kind of an American are you? What are you doing over here?. New York : Broadway Music Corp.
Bryan, Alfred and William Weston (words) and Jack Wells (music): Joan of Arc they are calling you. New York : Waterson, Berlin, and Co.
Burkhart, Addison: All aboard for home sweet home. New York : Al Piantadosi and Co.
Burnet, Dana (lyrics) an James H. Rogers (music): When Pershing's men go marching into Picardy. Boston : Oliver Ditson Co.
Earl, Mary (lyrics and music): Lafayette (we hear you calling). New York : Shapiro, Bernstein, and Co.
Egan, Raymond (lyrics) and Richard A. Whiting (music): They made it twice as nice as paradise and they called it Dixieland. New York : Jerome H. Remick and Co.
Ehrlich, Sam (lyrics) and Con Conrad (music): Oh Frenchy. New York : Broadway Music Corp.
Flynn, Allan J.: There's a green hill our in Flanders (there's a green hill up in Maine). New York : Al Piantadosi and Co.
Ford, Lena Guilbert (lyrics) and Ivor Novello (music): Keep the home fires burning (till the boys come home). New York : Chappell and Co.
Henry, S. R. and D. Onivas: Indianola. New York : Jos. W. Stern and Co.
Howe, M A. De Wolfe (words) and George W. Chadwick (music): The fighting men. New York : C.C. Birchard and Co.
Johnson, Philander (lyrics) and William T. Pierson (music): There's a call for you and me: carry on!. New York : W. T. Pierson and Co.
Judge, Jack and Harry Williams: It's a logn way to Tipperary. New York : Chappell and Co.
Kahn, Gus (lyrics) and Egbert van Alstyne (music): For your and my boy. New York : Jerome H. Remick and Co.
Kahn, Gus (lyrics) and Egbert van Alstyne (music): On the road to home sweet home. New York : Jerome H. Remick and Co.
Leighton and Leighton: There's a dark man coming with a bundle. New York : Helf and Hager Co.
MacDonald, Ballard (words) and Harry Carroll (music): At the Dixie military ball. New York : Shapiro, Bernstein and Co.
Maschwitz, Eric (words) and Michael Carr (music): He wears a pair of silver wings. New York : Shapiro, Bernstein, and Co.
McCarron, Charles and Nat Vincent (lyrics and music): When old Bill Bailey plays the ukalele. New York : Broadway Music Corp.
McCarron, Charles R. and Cary Morgan (lyrics and music): I'm glad I can make you cry. New York : Jos. W. Stern and Co.
McKenna, William: Mandy Lane. New York : Jerome H. Remick and Co.
Murphy, Stanley (lyrics) and Harry Puck (music): Cotton town. New York : Joe Morris Music Co.
Murray, Ernest: Bennington battle march. Boston : Hub Music Co.
Novello, Ivor (lyrics and music): Laddie in khakhi (the girl who waits at home). New York : Chappell and Co.
Portor, Laura Spencer (lyrics) and Harriet Ware (music): Mammy's song. Cincinnati : John Church Co.
Razaf, Andy (lyrics) and Thomas Waller and Harry Brooks (music): Ain't misbehavin': Connie's Hot Chocolates. New York : Mills Music Inc.
Stanton, Frank L. and S. C. Colburn: A plantation ditty. Boston : Boston Music Co.
Sullivan, J. L.: It's great to be a soldier. Boston : Strand Publishing Co.
Turk, Roy and J. Russel Robinson: Beale Street mama. New York : Waterson, Berlin, and Snyder Co.
Vanderveer, Billy J. (lyrics and music): In Mobile town. New York : Joe Morris Music Co.
Vanderveer, Billy J. (lyrics) and Seymour Furth (music): Hear the pickaninny band. New York : Joe Morris Music Co. Gift of various sources, including transfer from the Forbes Library (World War I) and James and Sibylle Fraser (African American). Processed by I. Eliot Wentworth, Feb. 2017. Cite as: Illustrated Sheet Music Collection (MS 960). Special Collections and University Archives, University of Massachusetts Amherst Libraries.